Eleanor is the new girl in town, which automatically means she’s lumped in with the unpopular crowd. And that would be OK if she could just blend in with the rest of the kids at school, but it’s kind of hard to miss someone with bright red hair and a kitschy sense of style. Park has lived in Omaha his whole life. But as a half-Asian, comic book nerd, he has yet to find exactly where he fits in on the social hierarchy ladder. On Eleanor’s first day of school, the only open seat on the bus is next to Park. Eleanor doesn’t want to sit there and Park definitely doesn’t want to interact with her either, so Park keeps his headphones on and Eleanor keeps her eyes on the floor. Things change though after Park catches Eleanor reading his X-Men comics over his shoulder, and a strangely silent friendship is born. Park slides comics across the seat for Eleanor to read. Eleanor slides them back after she’s done. Eventually the silence is breached, and as the weeks go on, comic books and mixtapes are shared and friendship begins to turn into something more special. 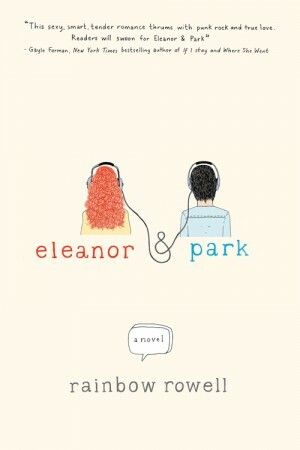 Voted the “Best Book of 2013” by librarians, GoodReads, The New York Times and appearing on multiple other “best of lists”, Eleanor & Park can really be summed up in one word: brilliant. At its heart, it’s an immersive love story between two teens in the 80s. But it also deals with other important issues head-on such as bullying, fitting in, inter-racial dating and overcoming obstacles in the face of adverse situations. I really appreciate reviewing your blog post Book Review: Eleanor and Park by Rainbow Rowell | lostbetweenthepages.